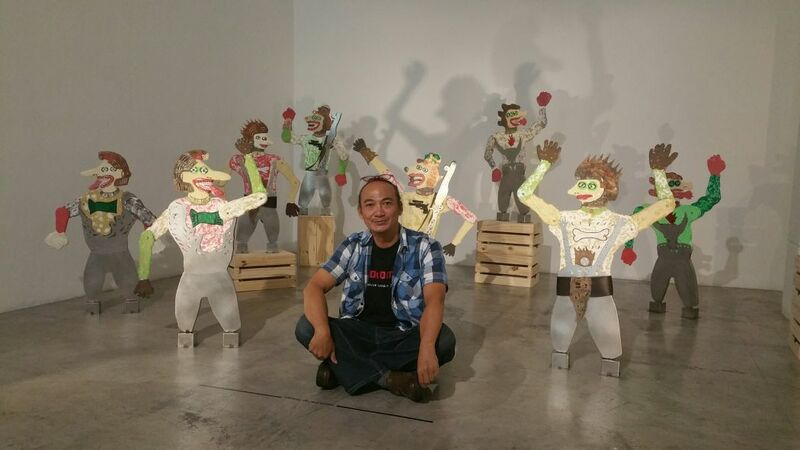 One of Indonesia’s foremost contemporary artists, Heri Dono is known for his highly recognizable iconography inspired by Javanese folk theater, such as wayang kulit (shadow puppetry), and comic books. While often darkly humorous, his performative works have a strong socio-political subtext, commenting on human behavior and contemporary issues like political corruption or damaging environmental policies. The 56-year-old artist’s latest exhibition, “Zaman Edan” (The Age of Craziness) at the STPI in Singapore, features 40 works created during a residency at the print institute, and while his usual iconography of fantastical hybrid creatures and pop culture motifs is omnipresent, there are also plenty of subtle new developments in the work — from the use of bright color to the creation of screen prints on canvas against photographs — to surprise visitors. “I was interested in questioning the meaning of print, and with the theme of Zaman Edan I was interest in questioning the meaning of expression and creativity, because expression is not always creativity. I see expression as closer to innovation, while to create is very close to inventiveness,” Dono says. The results of his latest batik experiments, now on view at STPI, have led to more colorful artworks, with the use of pink, purple, and orange, not usually associated with his practice. “Back in the ‘90s, my work was more colorful like this, but yes, of late it’s been much more muted, monochrome, and darker [in color], but with the use of textile, I was interested in recreating that batik atmosphere,” he says. Currently on view until June 30, “Zaman Edan” (The Age of Craziness) includes two large mixed- media installations, also created during his STPI residency. One is a herd of flying horses made with papier-mâché and painted with pulp paper using a spoon (“a bit like making a cake”) and the other is “Wayang Zaman Edan,” several mixed-media, gangster-like puppets (in copper, brass, stainless steel and papier-mâché), some holding guns, that he refers as today’s “age of craziness” and violence.